Today is the day! Week 6 of the One Room Challenge has arrived, and I'm so excited to show you guys our finished master bedroom. 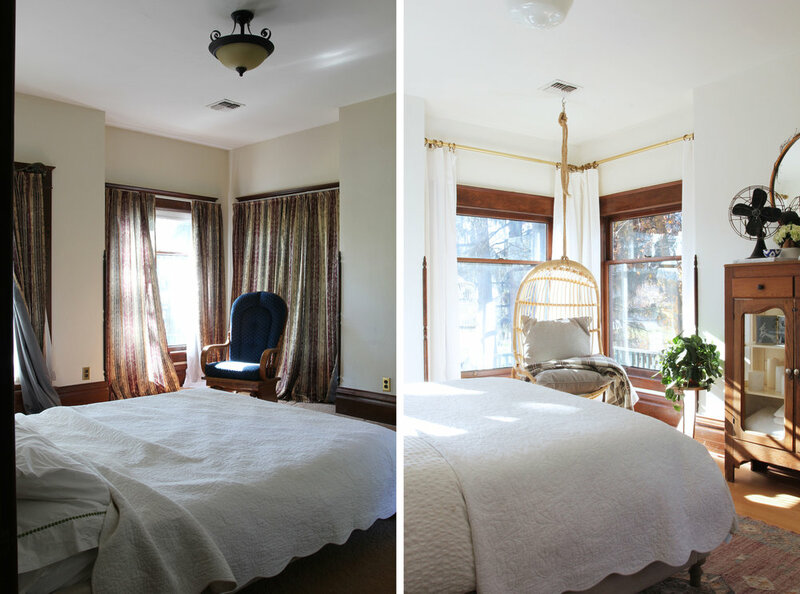 Six weeks ago, this room was dark and ugly and it's 104-year-old charm had been hidden away behind bad carpets and even worse drapes. In case you forgot, here's what the space looked like on day one. Bad, right?! Somehow Garrett and I lived in that for 3 months. The carpets were stinky and stained and screaming to be pulled, but we held off for the One Room Challenge, mostly because the boys' bedrooms were the priority. But once the boys were settled and October hit, Garrett and I got right to work on this room. We painted, pulled up carpets, refinished the floors, rewired some unexpected knob and tube, replaced the lighting, added base shoe, hung drapes, made nightstands, and decorated. The end result is bright, welcoming, and sooo us. The vintage theater seats, were one of the first things I picked for our master bedroom. I only had to search for a couple of days before finding our chairs at a salvage shop in Seattle. We also brought in a hanging chair for the corner by the windows. And let me just say, that chair has proven to be nothing short of perfection! We have quite a few trees on our property, some with colorful leaves still waiting to drop, and I intend to soak up every last bit of Fall from this spot. We had originally bought the hanging chair for Brooks' nursery, but since he's become a fearless climber at 13 months, the chair needed a new home. And truth be told, I'm so happy with it in here that I'm pretty sure Brooks will never get it back. If you've followed the Grit and Polish for long, you already know that this room was more of a cosmetic update than a full fledged renovation for us. Nonetheless, we ran into a few hiccups during this project. The hardwoods were in rougher shape than we had hoped; we found knob and tube wiring which required an extensive rewiring of the upstairs; and the existing molding stain was a custom color we couldn't quite match. All in all, none of the surprises were too major, but they definitely slowed us down. Garrett built our nightstands using leftover marble countertop from the Ravenna kitchen renovation. We used an antique table base for my side of the bed and a DIY shelf for Garrett's side. Our small nightstands provide plenty of space for our essentials without leaving so much space that they end up cluttered. Garrett's shelf also affords room for a basket of kids supplies for early morning snuggles (way, way too early of morning snuggles...thank you Day Light Savings). Last week, I talked about the wild goose chase I went on looking for an antique fireplace. I'd be lying if I didn't say that I miss the ambiance that a fireplace would have added to the room, but even so, I love the vintage pie safe I found for our large white wall. If we ever do find that antique fireplace, I'll happily move this piece to another spot. It's so much better, right?! Garrett and I are so happy to finally have a space we enjoy being in! My favorite part of this competition has been that it makes you finish a room 100%. Garrett and I are notorious for not finishing the final 5% of a renovation until we're about to move out, so the One Room Challenge was the perfect cure for that. Thanks ORC! And thank you for following along! I'd love to hear what you think of the space. You can get caught up on my previous posts here: Week 1, Week 2, Week 3, Week 4, Week 5. 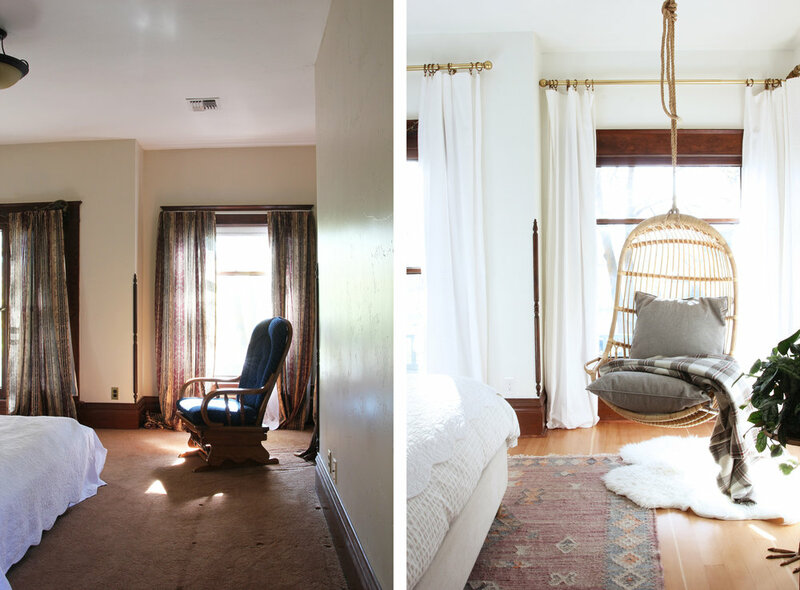 And if you're looking for more One Room Challenge makeovers, they're all linked here. I'll share some of my favorite ORC rooms next week here on the blog too. p.s. wallpaper in the kitchen is nothing new, but this big, bold, floral print in the kitchen...wow! p.p.s. the styling of this bed has me feeling all sorts of cozy! I'd love to buy a linen duvet cover, but I don't dare until our boys are older. p.p.p.s. I've been hearing good things about Amazon's new "Good Girls Revolt" show. Have you seen it? I'm excited to try it!